Millions of people are looking at homes damaged or destroyed by Harvey and Irma, two historic hurricanes that delivered deadly winds and rain to Texas, Louisiana, Florida and the Caribbean. Government officials have urged those affected to register for federal aid as soon as possible throughDisasterAssistance.gov, a website managed by the Federal Emergency Management Agency. People may receive grants to pay for temporary housing, home repairs and uninsured property loss, among other needs. 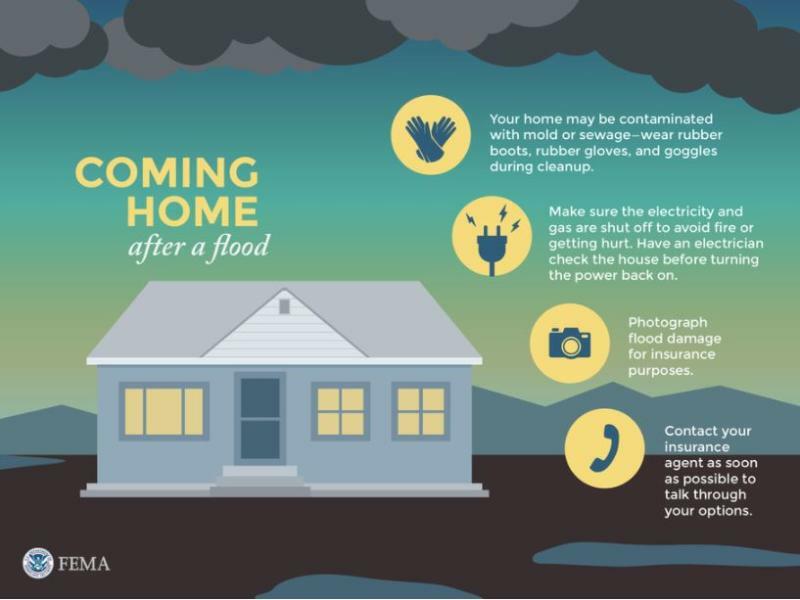 Those ready to begin the cleanup and rebuilding process can get advice from “Repairing Your Flooded Home,” a step-by-step guide put together by FEMA and the American Red Cross. But before they enter their homes to assess the damage, public health experts are urging people to take precautions to avoid any unnecessarily harmful situations. Volunteers from Performance Contractors help a co-worker clean up the damage to his Houston home after Hurricane Harvey. 1. Return home only when authorities indicate it’s safe. People should follow instructions from state, local and tribal officials on when it’s best to re-enter hurricane-affected areas, FEMA told HuffPost. You can look for guidance by monitoring local government agencies’ social media pages, press conferences and mobile alerts, as well as communicating with neighbors and other community members. 2. Brace for the emotional toll of seeing your house post-hurricane. 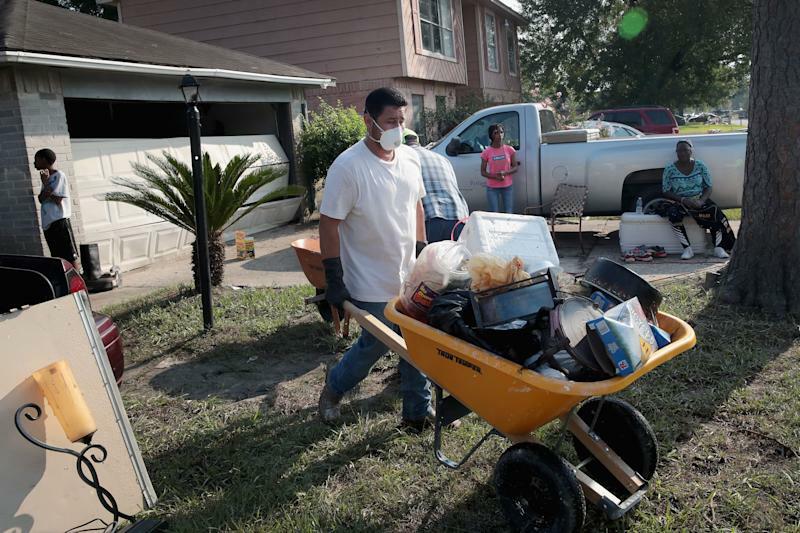 Dr. Umair Shah, executive director of Harris County Public Health in Texas, said that coming back to a damaged or destroyed home can have real mental health effects, including feelings of anger and even despondency. Children especially may be overwhelmed. Seeing destruction where they once felt safe and secure “can have a tremendous amount of psychological impact,” Shah told HuffPost. The best way to handle the emotional burden is to be open with family and friends about how you’re feeling and to seek professional assistance if needed. “Be thinking about what you’re going to see and be ready for anything,” Shah said. 3. Stock up on clean water. Before you begin cleaning and removing debris, it’s crucial to ensure you have enough drinkable water to stay adequately hydrated, according to Dr. William Schaffner, an infectious disease specialist at Vanderbilt University Medical Center. Some impacted areas may be under a boil-water advisory, so you may need to rely on bottled water from any open stores or local donation centers. Even if your home has running water, check your county’s public health website and social media pages to determine if it’s safe to drink. Make sure the electricity and gas on your property are shut off to avoid accidental fires and electrocution. Similarly, theDepartment of Homeland Security’s disaster readiness website warns to “avoid flood water as it may be electrically charged from underground or downed power lines.” Consider having an electrician check your house before turning the power back on, the agency recommends. 5. Throw away any potentially contaminated food. May have come in contact with floodwaters. Are stored in a refrigerator that was shut off for more than four hours. Have an unusual odor, color or texture. Canned foods that are bulging or open should also be thrown out. 6. Prepare for sewage, mold and wildlife in your house. Public health officials recommend wearing rubber gloves, rubber boots and goggles when entering a flooded structure. E. coli and other coliform bacteria from raw sewage that seeped into the floodwaters could cause illness, warned Dr. Renee Funk, incident manager for Hurricane Harvey response at the Centers for Disease Control and Prevention. “We do really recommend that if any part of their body touches the water, they should wash it,” Funk said. As for mold in these circumstances, Schaffner suggested there may be more concern than there is a “real hazard.” But if people are worried, he said, they could wear a surgical mask to protect against inhaling mold spores. In some Harvey-affected areas, there have also been reports of wild animals such as snakes,fire ants and evenalligators making their way through the floodwaters. Avoid wading in the water, if possible. 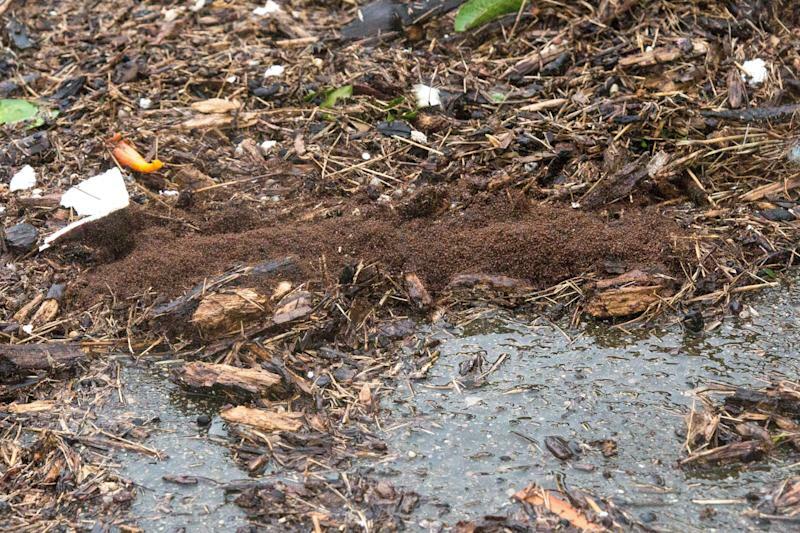 Fire ants cling together to ride out the floods during Hurricane Harvey. 7. Wash your hands often and sanitize contaminated items. Since floodwaters can be swimming with bacteria, sewage and chemicals, they may well have contaminated anything that got wet. “Anything that’s been exposed to flooded water really should be considered potentially dangerous,” Shah said. Harris County Public Health recommends disinfecting such items by soaking them in five gallons of clean water mixed with one cup of bleach. An item that cannot be sanitized, such as a mattress or cutting board, should be disposed of. “When it doubt, throw it out,” Funk said. Pools of standing water create an ideal breeding ground for mosquitoes, Schaffner warned. Mosquito-born viruses such as West Nile and Zika can spread in such conditions. 9. Don’t let your children or pets play in the floodwater. Children and animals may seek to cool off in the storm water. But between the risk of downed power lines and the near certainty of infectious disease agents and industrial waste floating around, it’s not safe. 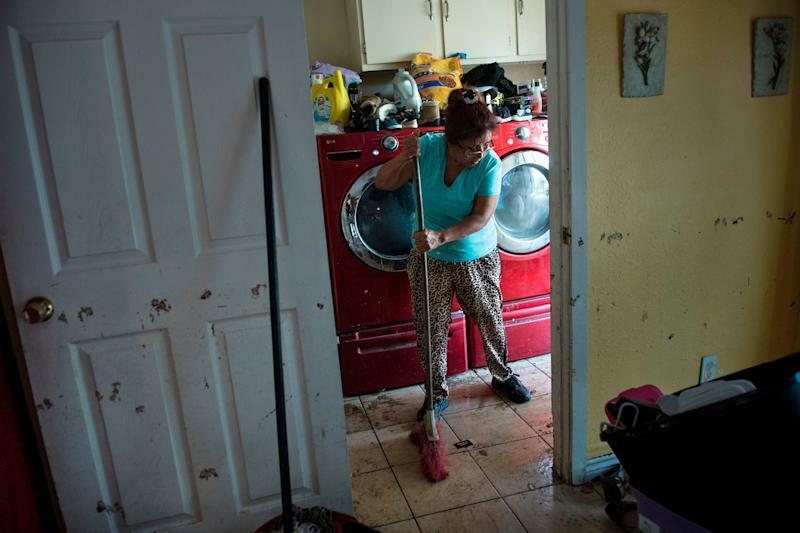 A woman cleans the floors of a once flooded house in Houston. 10. Document the damage to your property ASAP. Cleaning up and removing debris before documenting the damage caused by the storm could slash the amount of government aid you’re eligible to receive. Shah recommends taking a combination of still pictures and videos for insurance claims purposes. “The more documentation you have, the easier it is and the better it is, once you’re at the stage of filing your claim,” he said. Take breaks, stay hydrated and ask for help to avoid emotional and bodily injury. People are at especial risk of hurting themselves when they’re undertaking physical activities they aren’t used to, Schaffner warned.